On May 20, the British launched their attack. The militia scattered at the sight of the British troops, not offering any resistance and failing to notify Lafayette of the attack. On Ridge Road, the American group learned of the British attack. A small group was sent to fight a delaying action against the British while their commander sent word to Lafayette about the developments. After Lafayette learned of the attack, another patriot came up and told him of the British advance up White Marsh Road. Lafayette knew of another small road that led back to Matson's Ford that would bypass the British force. It ran along some low ground that would conceal the Americans from the British. The British did not know about this road. Lafayette ordered his men to retreat down this road while ordering a rear guard to delay the British at the church. A few small patrols were sent to engage the British, making them think that the American force intended to stay and fight. Lafayette calmed his retreating force and slipped away with relatively few casualties. On this day in 1778, British forces from Philadelphia attempt to trap 2,200 Continentals defending Valley Forge led by Marquis de Lafayette. Lafayette, through skillful maneuvering, avoids the entrapment and the destruction of his forces. 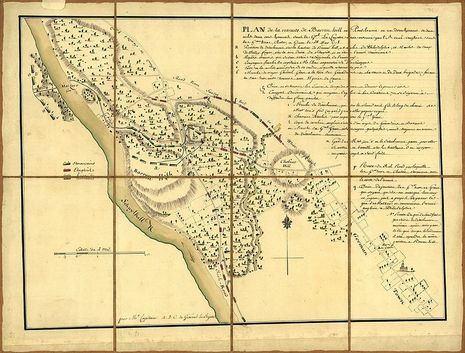 The encounter takes place at Barren Hill, now known as Lafayette Hill, just northwest of Philadelphia. Washington had dispatched Lafayette and his men two days before to spy on the British in Philadelphia. The British learned of Lafayette’s mission and intended to surprise, surround and capture the encampment with a force of 7,000 to 8,000 men. Lafayette, in turn, learned of the British plan late on May 19. Lafayette assigned 500 men and approximately 50 Oneida Indians armed with cannon to face the British onslaught and stand their ground by the local church, while the rest of Lafayette’s forces fled west over the Schuylkill River to safety. Before the Oneida warriors followed the Continental Army across the Schuylkill, they are believed to have bravely given chase to the British as they marched back to Philadelphia. Lafayette, a Frenchman, had personally recruited the Oneida to join the Patriot cause by using the Indians’ preference for the French over the English; the Oneida arrived at Valley Forge on May 13. Lafayette promised the Oneida that they would serve under French instead of colonial Patriot commanders and that they would be given assistance in building a fort at their Mohawk Valley, New York, settlement. These fresh Indian recruits were paired with Lafayette’s best Patriot fighters, fresh from training under European officers at Valley Forge. The Indians’ actions during the successful retreat at Barren Hill prevented disaster and allowed the Continental Army to emerge from Valley Forge as a disciplined military in June.